People who don’t have to be outside are cooped up and getting restless. Poker games with well-worn decks are running continuously in the usual tents, campaign currency and paper IOUs moving around fluidly. No one has much stomach for setting up pranks in this depressing weather. Most write letters or sit and read in their off hours. One well-worn bit of reading material is a copy of Yank magazine from back in June. The big cover story is a piece that directly asks the question, “How Long Will We Have to Fight the Jap War?” It’s the standard question here, and it has a lot of standard answers. Answers run from confident predictions to uncertain humor like “Golden Gate in ’48!” to more somber reflections that other soldiers don’t want to hear. Last I looked, there still weren’t any units from Europe in the Pacific. I suspect the boys already here will carry on with what they have for at least the next big job. 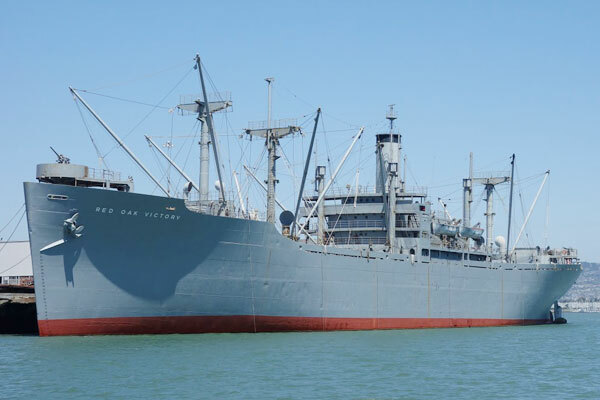 I called the Red Oak Victory a Liberty ship, but she is actually a newer “Victory” ship, technically of the Boulder class. The Victory ships carry a little bit more than the Liberty ships, and go a lot faster. They take more than a week off a trans-Pacific route, and then get back another week sooner ready to take another load. Mariners will have noticed that I called this ship a “USS” and I am not mistaken in that. The Red Oak Victory is under U.S. Navy command and crewed entirely by officers and sailors. She is not a civilian Merchant Marine vessel. Her main job up to now has been hauling ammunition, and delivering it directly to other ships while the fleet was still at sea. This ship is armed almost as well as the small destroyer I was on in Hawaii. Small and medium caliber guns ring the upper decks, making air attack dangerous (to the aircraft). The one big gun is on the back, all the better for making distance between us and a submarine running on the surface. These guns would be run by a Navy contingent on a Merchant Marine ship. Merchant Marine ships have seen plenty of action in this war, some scoring multiple aircraft kills in a single attack. As I write this Okinawa is already in sight. A ship like this can get from the Marianas to the Ryukus in four days, even when running a zig-zig course to frustrate a submarine captain trying to time a torpedo into the same place as our ship. The run is not done in convoys; the whole shipping lane is patrolled from the air. Navy sea planes get regular catches of big tin fish with bombs and depth charges, but the situation makes the Atlantic veterans in this crew nervous. A line of well armed destroyers would certainly make a more reassuring security blanket. We made this run without incident, and are ready to unload. 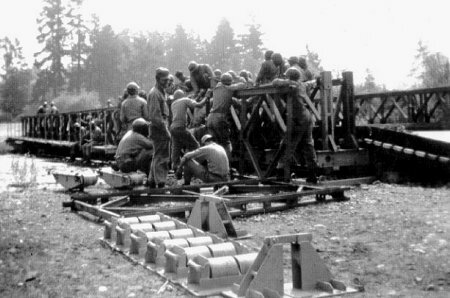 But we’re on the familiar military schedule of ‘hurry up and wait.’ Okinawa still does not sprout enough piers and cranes for our ships to be unloaded fast enough. We will anchor in the far spread arms of what has been renamed Buckner Bay on the east side of the island, before getting directed to a pier, which could be at the nearby naval base or all the way around the island at Naha. I am taking the opportunity to catch up on reading. The ship has a decent little library, and takes on new magazines and books when it can. Much of the recent news is from the big conference at Potsdam, Germany. President Truman should be just on his way back from that big to-do, where it is supposed that the whole post-war world was neatly drawn up. Except of course that sketch depends on the Japanese playing their part according to the artists’ vision. Toward that end they issued an ultimatum to the Japs, that people are already referring to simply as the ‘Potsdam Declaration.’ It is not a long document. It spells out concisely that we intend to completely re-make Japan, not just defeat her, and that we have the means to do both. I read the whole text, and took particular note of the end. We are here to unload a full cargo of heavy bombs for the heavy bombers. I survey the vast mob of other ships anchored here waiting to unload assorted deadly cargoes, and I have no doubt about the thoroughness we intend to exhibit. 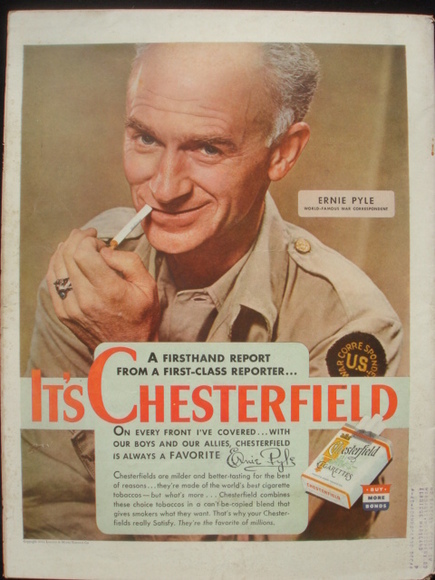 Born August 3, 1900, Ernie Pyle told the story of America by telling the stories of Americans. When he perished under fire in the Ryukus, an enormous void was left behind in the world of journalism and in the hearts of soldiers, mothers, sailors, bothers, tradesmen, and every other sort of reader everywhere. Even our own Walt Tuttle was speechless over the event. Among many lengthy obituaries, the New York Times had this to add. No man could have been less justified in such a fear. Word of Pyle’s death started tears in the eyes of millions, from the White House to the poorest dwellings in the country. President Truman and Mrs. Eleanor Roosevelt followed his writings as avidly as any farmer’s wife or city tenement mother with sons in service. Mrs. Roosevelt once wrote in her column “I have read everything he has sent from overseas,” and recommended his writings to all Americans. For three years these writings had entered some 14,000,000 homes almost as personal letters from the front. 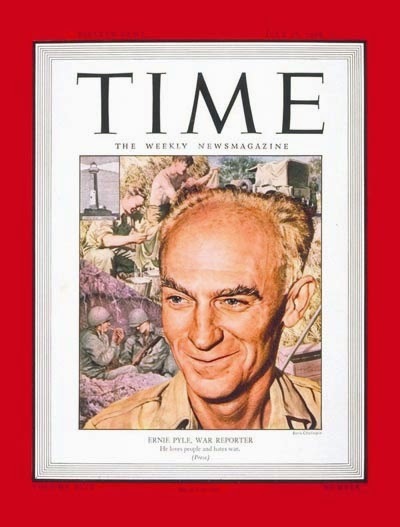 Soldiers’ kin prayed for Ernie Pyle as they prayed for their own sons. While terribly modest about it, Pyle’s fame allowed him into places other people could not intrude, especially into the confidence of greasy workers and low-level enlisted men. [Tuttle confessed to riding Pyle’s coattails into low places many times.] He had this story to share about one modest but distinctive honor. agents to know how many guys had been fished out of the water. "Service units available for this operation are limited in number. Office of the Commanding General.